Atomic Horizons does not even try to hide the fact that it is a highly suspicious HYIP scheme, instead going the way of the “reasonable,” medium HYIP setup, which may have indeed sucked in a number of people before it reportedly stopped paying. The reason behind this stop? They obviously ran out of other people’s money and the pyramid handily collapsed, as is the case every time with these schemes. Can I Trust Atomic Horizons? No, taking the above said into account, we would have to say that you definitely should not trust this Ponzi scheme. 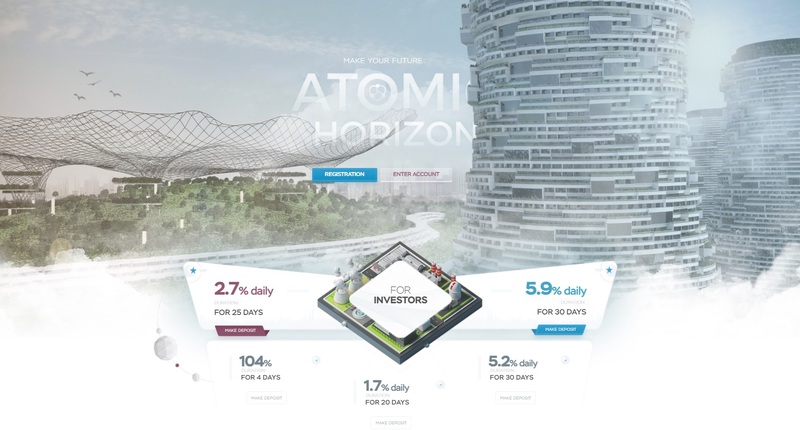 Like every other similar HYIP scam in existence, Atomic Horizons offer investors an impressive selection of investment packages, each and every one of which is indeed too good to be true. One such package offers a return of 104% for 4 days, for an investment ranging from $5 to $100. Another offers 34% for 20 days, and yet another promises 177% for 30 days. Obviously, the scammer is looking to lock up monies for as long as possible, as that way, it can keep the Ponzi scheme running for longer. As said above though, several sources report that Atomic Horizons has already stopped paying, so its race has basically been run. Red flags and question marks abound in the Atomic Horizons offer, even if we are to cast aside the fact that these days, there are more nuclear power stations being closed than built, so the industry is hardly as dynamic as they make it out to be at the site. The site does not feature a proper About Us section. While it does in fact have such a section, it is filled up with the sales pitch and not by information about who the people behind the operation are. We do learn that the corporate entity behind the site is Atomic Horizons Ltd, registered in the UK under company #10694627. We also learn that the said company was incorporated on March 28, 2017, which is at least a little weird, considering the fact that in several spots throughout the site, it is claimed that AH have been involved with the nuclear industry for 4 years. The domain itself is obviously a throw-away one as well: registered in March, 2017, it has the identity of its registrant under privacy lock. The complaints about Atomic Horizons span the usual range. The bottom line in this regard is that they no longer pay and that they are scammers. Atomic Horizons is another standard online pyramid scheme, which – as evidenced by a number of user reports – has already run its race and is on the way out. Review Verdict: Atomic Horizons is a SCAM! At the time of posting this review, the domain Atomic-Horizons.com was already down, it seems. Before the site was terminated, it was already getting nice amounts of traffic, mostly via referrals done by websites, such as profvest.com and millioninvestor.com. According to SimilarWeb many of their visitors were from Russia (more than 30%), as well as Germany, Ukraine, Italy, Spain, Singapore, Poland, Taiwan and other countries. Their Alexa global rank was 214,425. If anyone has any information about this company, including if they have moved to a different domain, please let us know by commenting below.